I was at this gig so I decided to edit together a little keepsake. This previously unseen footage was taken from an unreleased documentary. Last edited by kurgan on Sat Aug 23, 2014 3:17 pm, edited 16 times in total. How do I get rid of those unrelated suggested links at the end of the video!!!! kurgan wrote: I was at this gig so I decided to edit together a little keepsake. Here is the full edit I put together of all the footage I could find of that night. kurgan wrote: Here is the full edit I put together of all the footage I could find of that night. How I wish they would release the complete second night. Do you think it could happen in 2017? Last edited by kurgan on Sun Oct 01, 2017 3:16 pm, edited 1 time in total. Such incredible footage, thanks for sharing. Wow! Thanks. When you say the footage is from an unreleased documentary, is that an officeial QPL one that didn't get aired, and if so, can you give any details of when it was originally planned for? 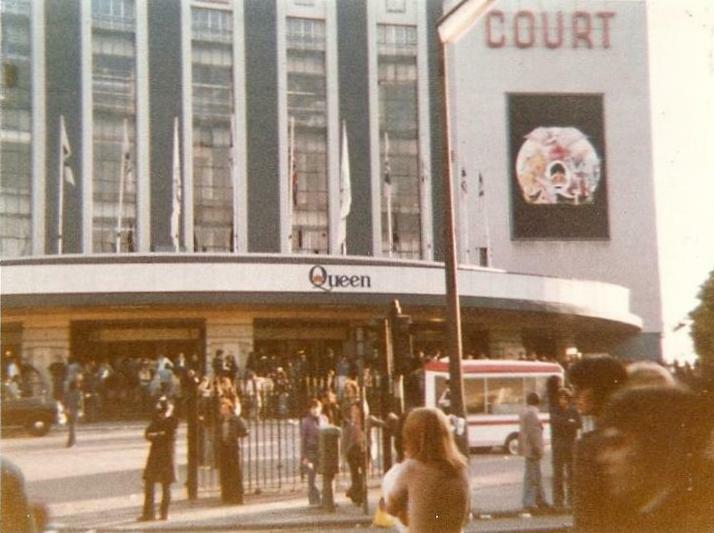 I wonder what ever happened to that giant banner, poster or sign with the Queen A Day At The Races crest on it ? Would be something to own these days..
My guess is that they threw it in the bin, sadly..
Fun fact: In the parking house in Earl's Court, they shot a scene for Highlander in 1986. To make it look like it was filmed in the USA, they used lots of American cars with US license plates on them.